Daily deal sites like Groupon and LivingSocial offer a ton of deals and discounts and on everything under the sun, from passes to the zoo to Halloween costumes (boo!). With so much choice out there, it’s almost impossible to keep the daily deals you purchase organized. 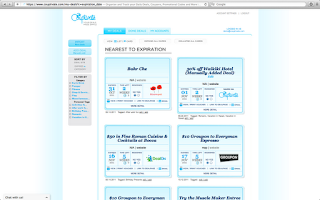 EnterCouptivate,a freeonline daily deal wallet that securely stores and organizes all of your daily deal purchases. 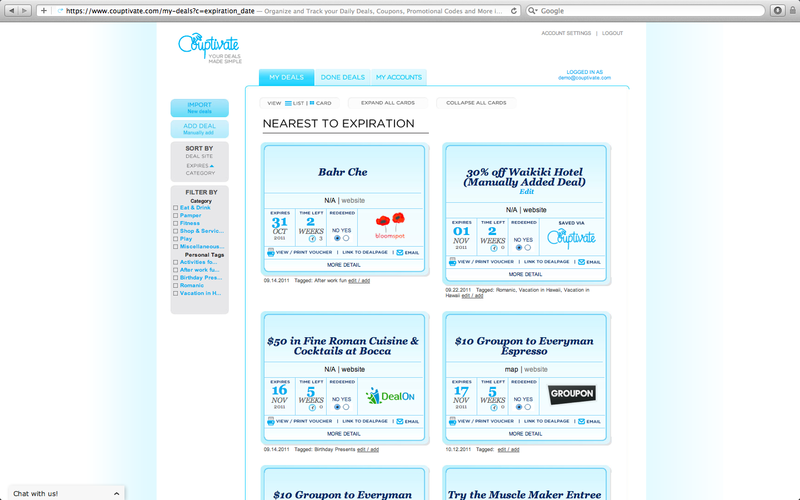 It takes just 5 minutes to register for a free Couptivate account and get your deal portfolio set up. Once your account is set up, Couptivate grabs any purchase you make on a daily deal site automatically from that website and organizes it in a portfolio.You’ll be able to see every daily deal you’ve purchased on one single page (you might even find a few you had forgotten about). You can also set email reminders so you’ll never forget your deals (and have them expire). Couptivate also takes security seriously. It uses the same type of security measures used by banks and all data, including any login information you submit, is protected and validated by VeriSign. You can find out more about Couptivate by "like"ing them on Facebook or following them on Twitter. This is such a GREAT concept ... stop by and check them out! !